American political sentiments are routinely considered to be utterly shallow, and perhaps no material thing risks confirming this more than the prosaic bumper sticker. 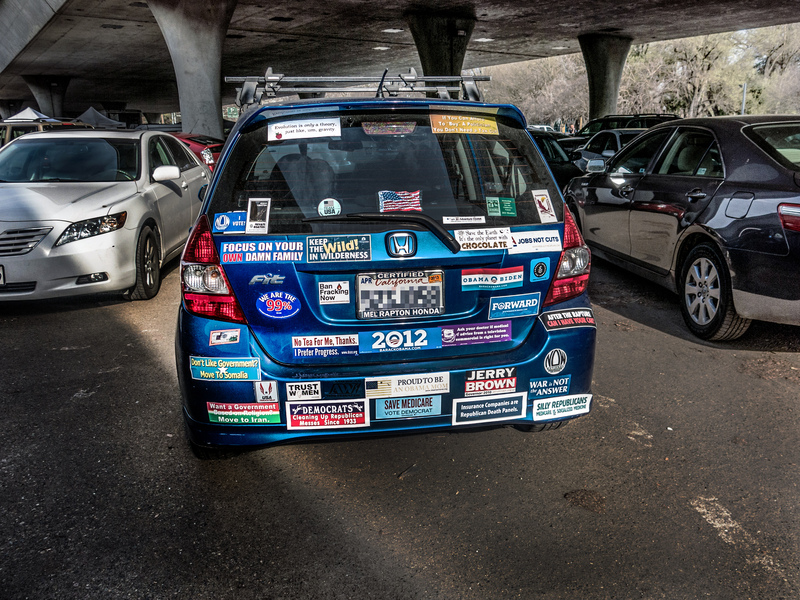 Bumper stickers now signify nearly every dimension of identity and politicized interests: a driver can signal their sports fan affiliation, express contempt for other auto makers, embrace their faith (or resistance to it), underscore their geekery, and display their university attachment. The stand-by political bumper sticker still graces many cars, but now cars are personally crafted billboards displaying nearly any identity niche or political sentiment that can be distilled to a few words or a single symbol. Those symbols and sentiments are necessarily put in the most straightforward if not simplistic terms, and observers tend to see bumper stickers as clumsy communicative displays of social identity and broadly defined political interests. 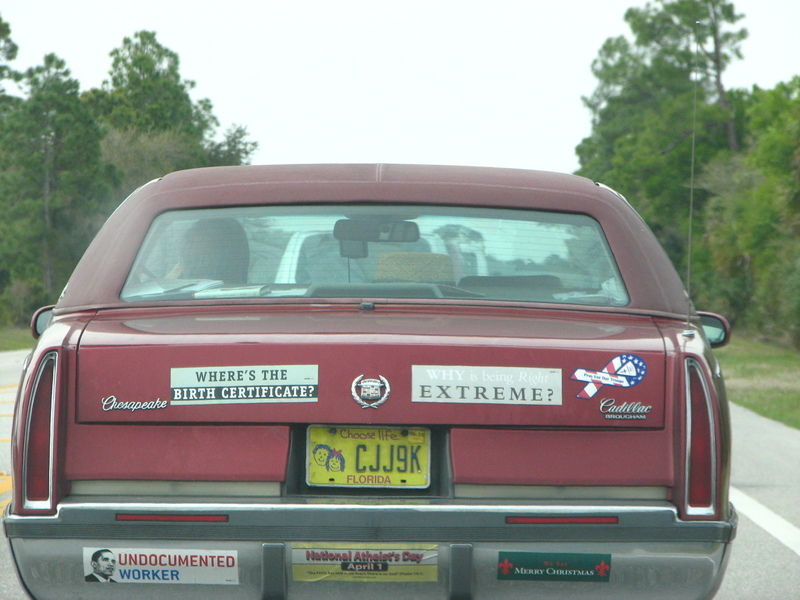 Nevertheless, the increased consumption of bumper stickers may reveal far more complex politics than merely supporting a partisan cause, and the “dialogue” of bumper stickers is perhaps most accurately described as a “soliloquy”: that is, rather than instrumentally communicate political positioning and identity to others, stickers are instead a driver imagining themselves and how they are seen by others. Bumper stickers emerged around World War II, with most sources suggesting that the first bumper stickers were made by Kansas City silk-screener Forest Gill. Stickers were used in the Eisenhower campaigns in 1952 and 1956 and heralded various travel destinations (e.g., South of the Border stickers apparently were plastered onto a vast number of American bumpers after it opened in 1949). Stickers appear to have been produced consistently in the following half-century, but there is not any especially systematic inventory of the quantities of stickers, range of messages, or changes in their consumption over time. In 1992 Charles E. Case conducted one of the few systematic studies of bumper stickers when he inventoried 2160 vehicles in Riverside, California. Case found that 39% of the cars had one or more messages in the form of window decals, license plate frames or bumper stickers (217 had bumper stickers). Political messages were not especially common, with school and university affiliations the most common theme emblazoned on the Riverside cars, and more stickers were found on older and less valuable cars than more recently purchased ones. Twenty years later a vast range of marketers are producing bumper and vinyl window stickers in every conceivable motif, and nearly anybody with a decent printer can make their own individual stickers. The result is a cacophony of messages adorning American bumpers and windows that may well instrumentally communicate our endless divisions and insular allegiances as we zip by each other. 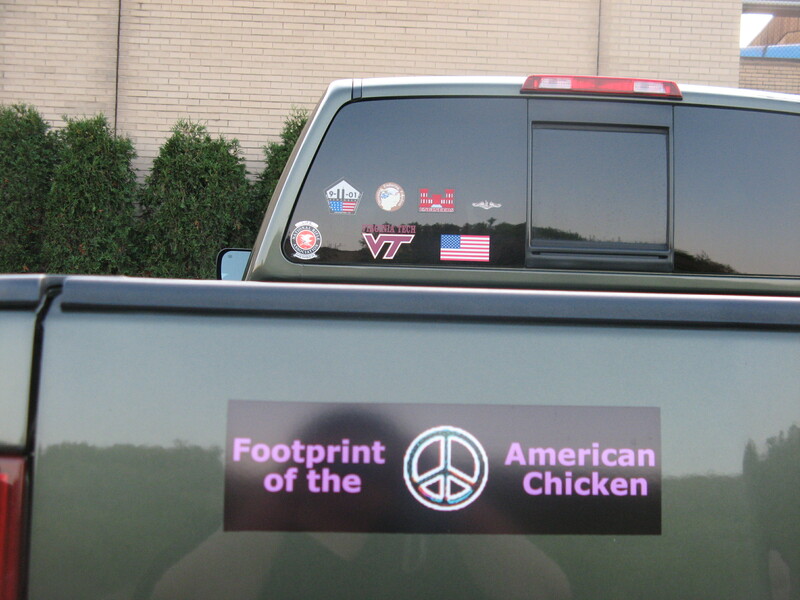 However, perhaps those stickers are less about a concrete message and cause (e.g., “Vote for Obama”) than a driver’s effort to evoke imagined personality attributes and individuality; that is, bumper messages aspire to imagine individual personality through novelty, creativity, or an embrace of marginality and self-perceived difference. 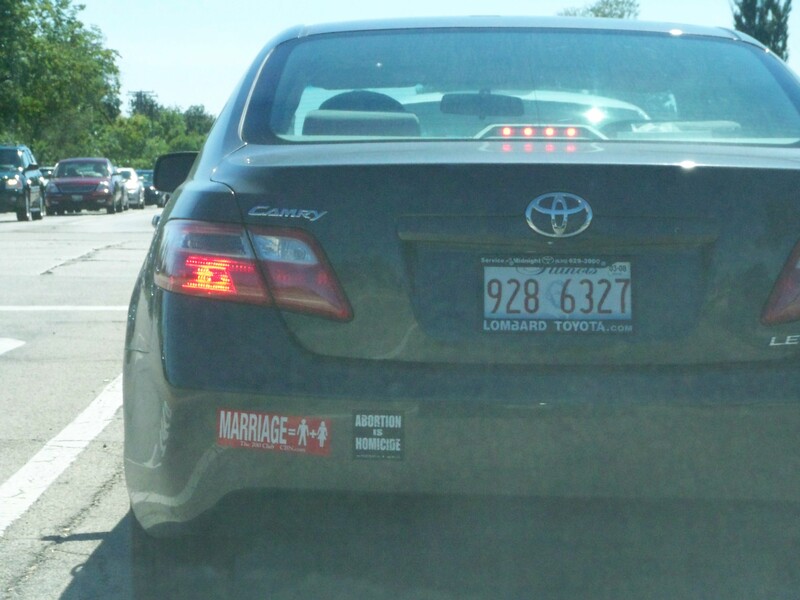 Bumper stickers are not necessarily efforts to forge relationships with like-minded people or alienate others while we sit at the stoplight; rather, the dialogue is with ourselves and how we fancy those symbolic messages portraying us. A bumper sticker can nearly never be a communication with others as much as it is a soliloquy in which we imagine how our bumper messages are perceived and portray us. Much of American bumper symbolism subverts recognizable aesthetics and messages. The power of evocative symbols and aesthetics like the Obama campaign’s blue and red palette and fonts is reflected in the vast number of stickers that appropriate the same aesthetics for anti-Obama messages that are variously funny, profane, and in some cases brazenly racist. 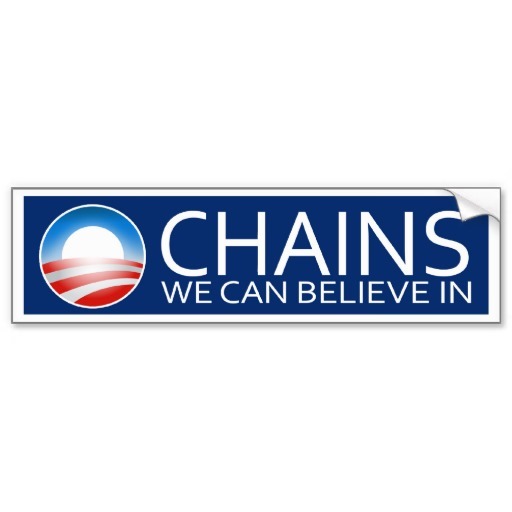 Popular cultural motifs are routinely evoked on bumper stickers, such as a Joker sticker that puts the President in maniacal Heath Ledger whiteface emblazoned with “Socialist”; Confederate flags; Calvin urinating on the Commander-in-Chief; or stickers suggesting Obama was born in Kenya. The volume of anti-Obama stickers hawked online seems to out-weigh those championing the President, but we might well have said the same thing for his predecessor (George W. Bush was subjected to stickers that likened him and Vice-President Cheney to Nazis; displayed a noose with his name; or compared him to Nero). 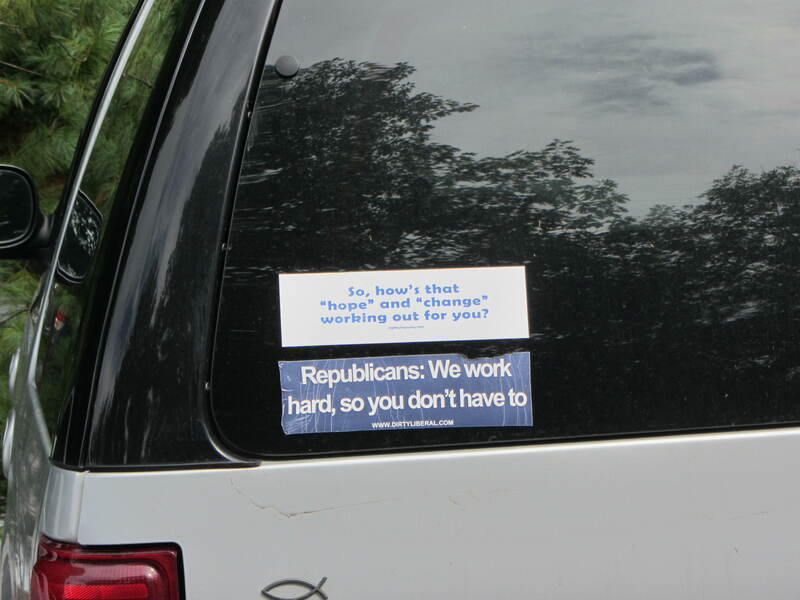 This may reflect that the bumper sticker is often the refuge of those frustrated with public discourse and their failure to prevail at the ballot box: demoralized with partisan politics and seeking political expression with efficacy, a sticker broadcasts frustration, anger, and disillusion. The bumper sticker is not a political strategy winning others over to our perspective; it is simply a tactical rant broadcast into open space using one of the few mediums—a car on public roadways—that virtually all of us share. The Ichthys symbol (sometimes referred to as a “Jesus fish”) is an interpretation of an early Christian symbol that became popular in the 1970’s and was soon appearing on car bumpers as well as jewelry and clothing. 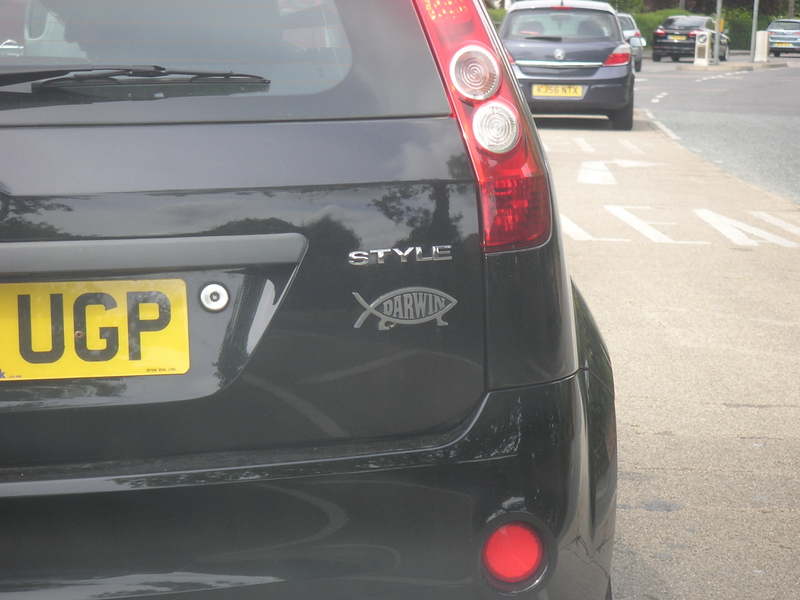 What offended many of the people whose cars displayed Ichthys fish was that the expression of faith was greeted by a critical response subverting that symbol. The “Darwin fish” was developed in 1983 with the fish turned in the opposite direction and sporting feet, sometimes with Darwin’s name in the center of the fish symbol; in some hands it is an atheist symbol, and others claim it as an evolutionary (or anti-creationist) marker. Plastic Darwin fish car ornaments were first sold in 1988, and numerous variations have since emerged including Gene Roddenberry’s Trek Fish, T-Rex eating Ichthys fish, Yoda fish, and Cthulhu fish, while Christians have replied with Truth fish eating Darwin fish and a Star Spangled fish. In 1998 The Weekly Standard’s Christopher Caldwell argued that the subversion of the Ichthys symbol breaks an unspoken truce on public expressions of identity. Caldwell argued that “once it is acknowledged that we are talking about identity politics, we are talking about something on which — in this country at least — a clear-cut decorum has developed. Namely: It’s acceptable to assert identity and abhorrent to attack it.” As a privileged symbol of faith and selfhood, Caldwell argues that the Ichthys car ornaments should be outside civil critique, but casting some symbols as inviolate is infeasible. Essentially, the identity being imagined by the Ichthys fish driver was disrupted by an audience that viewed the fish as a proselytizing dialogue that violated the silence of bumper sticker communication. In 2008 conservative commentator Jonah Goldberg’s rant against the Darwin fish captured an interesting dimension of bumper sticker communication when he acknowledged that “the most annoying aspect of the Darwin fish is the false bravado it represents. It’s a courageous pose without consequence. Like so much other Christian-baiting in American popular culture, sporting your Darwin fish is a way to speak truth to power on the cheap.” Bumper stickers are perhaps “false bravado” in the sense that they are political statements that do not subject themselves to the rules of civil discourse, delivered by an anonymous driver and providing no opportunity for response; his allusion that these prosaic bumper ornaments “speak truth to power on the cheap” reveals his frustration that such guerilla tactics attack his cherished symbols of selfhood on the new public square—that is, the public roadways–without any opportunity to respond. 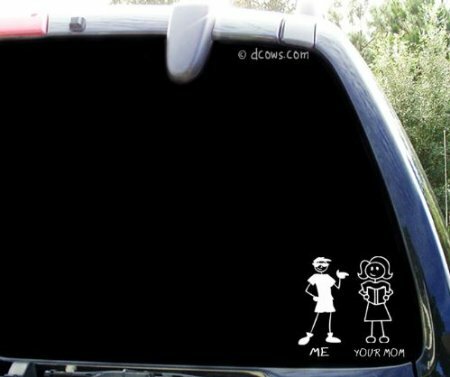 An Idaho firm began to produce stick figure family stickers in 2006, a seemingly mundane if over-earnest expression that crafts a car’s occupants in its own eyes as “family,” which may mean many different things in various hands. This show of family is probably more for the occupants than those of us driving alongside them, but for some observers the aesthetic reduces any domestic unit to interchangeable sticks. Some stick figure families have been personalized by adding the family members’ names and distinctive physical characteristics (e.g., hair), occupational references, or material details (e.g., golf clubs). However, the addition of details like cheerleaders’ pom-poms, a cat, and plaid shorts seem to make the anonymous and interchangeable stick figures even more mainstream and advocating at least implicitly for a domestic normality not all of us embrace. 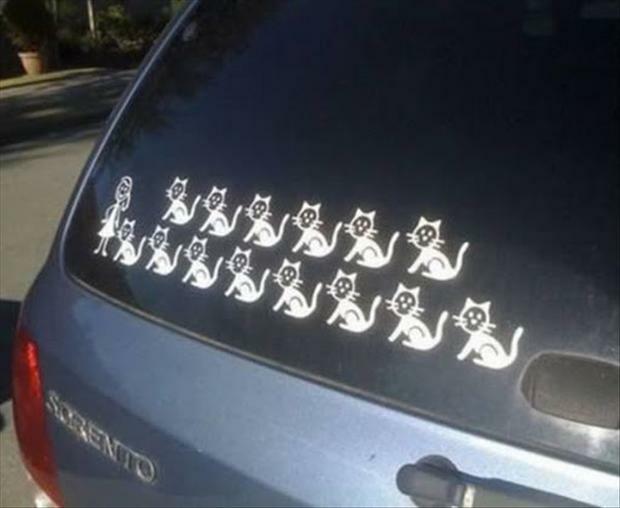 Now a universe of family stickers have appropriated the conventional stick family to various conservative and subversive ends. Some borrow from popular cultural franchises, reproducing the same aesthetics of linear stick figure families but in the form of Star Wars, Harry Potter, Hello Kitty, Transformers, or Doctor Who. Yet these hazard simply repeating the original imagination of family within a contrived appearance of pop cool. 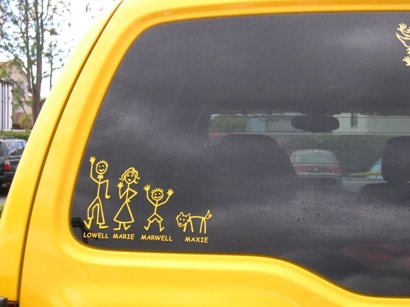 The more subversive stick figure families now adorning American cars take aim on the apparent compulsion to broadcast family identity to the world: various aliens, bad drivers, and chainsaw wielding characters proclaim that “nobody cares about your stick family” as they attack fleeing stick figures, while other families are being consumed by T-Rex , zombies, or Honey Boo-Boo. Other single stick figures proudly pose with “your mom,” display a stick figure family being hanged, feature single cat ladies, include a variety of politically incorrect stick figures (e.g., strippers), re-make the family as guns, or illustrate stick figures “making” their family. These stick figure units are not really a critique of the conventional family. Instead, they are an assault on bumper stickers whose imagination seems like a public advocacy of a particular vision of normality. In this sense, some stickers violate the unspoken rules of bumper communication as a soliloquy: they may still be statements of how a driver wishes to see themselves—person of faith, progressive, geek—but the symbols sometimes incite a frustrated response that will never be heard as the sticker drives away. Bumper stickers are simply evocative and imaginative musings that wield the most essential aesthetics and words to ambiguously hint at how a driver wishes to see themselves and be seen by others. In a digital world of rapid and highly individual communication–and in a society in which the car may be one of our most consequential material things and the roadways may be America’s most prominent public spaces– it is perhaps not surprising that our politics and personalities have been boiled down to such bare essence that expresses itself imaginatively without expecting any response. 2012 Status Symbols in Triathlete Culture. Master of Arts Thesis, Florida Atlantic University. 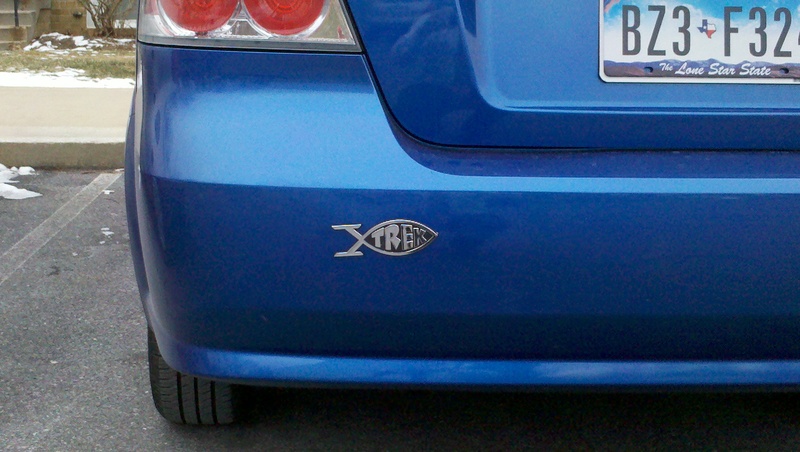 Posted on July 10, 2013, in Uncategorized and tagged #WPLongform, bumper stickers, Jesus fish. Bookmark the permalink. 8 Comments. Reblogged this on Tattoos and the TARDIS. When referring to Goldberg’s discussion of the Darwin fish vs. the Ichthys fish, you state that Goldberg was just expressing, “…his frustration that such guerilla tactics attack his cherished symbols…” I don’t exactly see what you mean here. Since Goldberg isn’t Christian, in what sense is the Ichthys fish a cherished symbol of his? Goldberg’s story in this piece about his visit to Istanbul does indicate that an anonymous Turk drew an Ichthys fish to demonstrate that “he was a Christian just like me,” even though Goldberg does indeed underscore in other columns that he is indeed not Christian; perhaps my point that needed to be made with more clarity here was that Goldberg is defensive of the symbolism of Christianity–which in the US has recently been closely associated with the political right–even if he may not be Christian. The assertion that a person can post a religious or political message on their without person risk is uninformed. If you stray beyond the norms of your community, you certainly can suffer harm. From loss of job, being cut out of granddad’s will, divorce, or the more likely vandalized car, every brave person who displays a controversial message take a risk. There is nothing implied in the post ignoring the genuine risk that might be posed by a sticker, t-shirt, or any oppositional politics.